How can Sweden’s higher education institutions support work to promote refugee inclusion in Europe? You are invited to participate in an international workshop to discuss initiatives and recommendations. 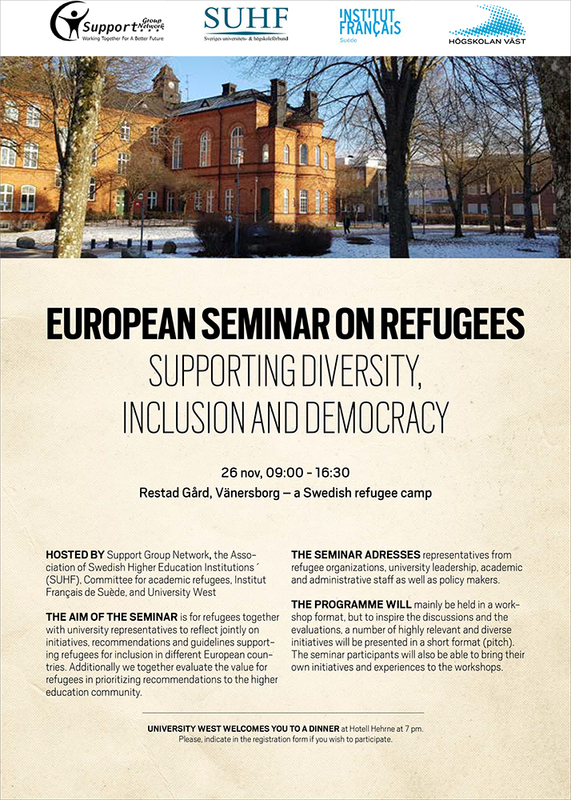 The European Seminar on Refugees is a collaboration between the Committee for Academic Refugees of the Association of Swedish Higher Education Institutions (SUHF), the Support Group Network (a Swedish refugee-driven organisation), the Institut Français de Suède, and University West. The workshop is an opportunity for employees in higher education and people with refugee background to meet and discuss initiatives and recommendations to support work to promote refugee inclusion in Europe. It will focus on what can be done from the perspective of the higher education institutions. The seminar will be held at Restad Gård in Vänersborg on 26 November. More information, the programme and details of how to register are available in the invitation.